Rice vermicelli are a thin form of rice noodles. They are sometimes referred to as rice noodles, rice sticks, or bee hoon, but they should not be confused with cellophane noodles, which are an Asian type of vermicelli made from mung bean starch rather than rice. Rice vermicelli are a part of several Asian cuisines, where they are often eaten as part of a soup dish, stir-fry, or salad. One particularly well-known, slightly thicker variety, called Guilin mǐfěn (桂林米粉), comes from the southern Chinese city of Guilin, where it is a breakfast staple. Beginning July 1st, 2014, Food and Drug Administration of Taiwan rules that only products made 100% of rice can be labeled and sold as "米粉" in Taiwan, usually translated as "rice vermicelli" or "rice noodle". If the product contains starch or other kinds of grain powder as ingredients but is made of at least 50% percent of rice, it is to be labeled as "調和米粉", meaning "blended rice vermicelli". Products made of less than 50% of rice cannot be labelled as rice vermicelli. Cantonese noodles: A large number of Cantonese dishes use this ingredient (called 米粉 maifun or rice in Cantonese). Usually the noodles are simmered in broth with other ingredients such as fish balls, beef balls, and/or fish slices. In Fujian and Teochew cuisine, rice vermicelli is a commonly used noodle and is served either in soup, stir-fried and dressed with a sauce, or even 'dry' (without soup) with added ingredients and condiments. Singapore-style noodles (星州炒米, Xīng zhōu cháo mǐ) is a dish of fried rice vermicelli common in Hong Kong Cantonese-style eateries, inspired by the spicy cuisines of Southeast Asia. This dish is made from rice vermicelli, char siu, egg, shrimp and curry. In Malaysia, the rice vermicelli can be called and found as Mihun, Mi hoon, Mee Hoon, Bihun, or Bee Hoon. Bihun Sup is a Malay style dish, mixed with spiced beef broth or chicken broth. Sometimes it comes with sambal kicap (pounded bird's eye chilli mixed with dark soy sauce) as a condiment. Bihun Kari mixed with curry, added with mung bean sprout, fried tofu and red chillies sambal. Bihun soto is in a yellow spicy chicken broth, served with chicken and potato cutlet. Hokkien mee throughout Malaysia varies considerably due to regional differences. Bihun Tom Yam is mixed with tom yam. Laksa Sarawak is mixed with a base of sambal belacan, sour tamarind, garlic, galangal, lemon grass and coconut milk, topped with omelette strips, chicken strips, prawns, fresh coriander and optionally lime. Ingredients such as bean sprouts, (sliced) fried tofu or other seafood are not traditional but are sometimes added. Mi Siam is a stir-fried style dish. Kerabu bee hoon is a Nyonya-style rice vermicelli dish, mixed with herbs and other seasonings. 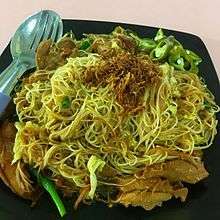 Hokkien mee, commonly in Singapore, consists of rice vermicelli mixed with yellow noodles and fried with shrimp, sliced cuttlefish and pork bits. Hokkien mee throughout Malaysia varies considerably due to regional differences. Satay bee hoon is rice vermicelli served with spicy peanut satay sauce, common in Singapore. Mohinga, in Myanmar, is rice vermicelli served with curry gravy and fish. Mont Di is rice vermicelli served with clear fish soup or as salad with fish flakes. Bihon (aka bijon) is the type usually associated with the word "Pancit", very thin rice noodles. Taiwanese fried rice vermicelli is the dry, stir-fried local style (particularly known in the Hsinchu region). Its main ingredients include sliced pork, dried shrimp, and carrots. A Hsinchu specialty is to serve rice vermicelli 'dry' 乾 (gan, not in a soup) with mushroom and ground pork. Bún riêu is rice vermicelli in soup with crab meat. Bún bò Huế is rice vermicelli in soup with beef from Huế. Bún thịt nướng is a Vietnamese dish consisting of grilled pork (often shredded) and vermicelli noodles over a bed of greens (salad and sliced cucumber), herbs and bean sprouts. Also, it often includes a few chopped spring rolls, spring onions, and shrimp. It is commonly served with roasted peanuts on top and a small bowl of nước chấm. Gỏi cuốn is rice vermicelli with shrimp and herbs in a rice paper roll. ↑ Lori Alden (2005). "Asian Rice Noodles". Retrieved November 4, 2011. ↑ www.fda.gov.tw. "市售包裝米粉絲產品標示規定". Retrieved 22 July 2016. ↑ www.fda.gov.tw. "食品標示法規手冊" (PDF). Retrieved 22 July 2016. ↑ "Singaporean Fried Rice Noodles". tastehongkong.com. 21 April 2010. Retrieved 13 August 2012. ↑ "How to make perfect Singapore noodles". theguardian.com. Guardian News and Media Limited. Retrieved 12 June 2014.